The Sweeney Chevrolet Buick GMC RUSH Sportsman Modified Series powered by Pace Performance participated in their first of two Bicknell Racing Products Touring Series events of the season at Sharon Speedway on Saturday night. 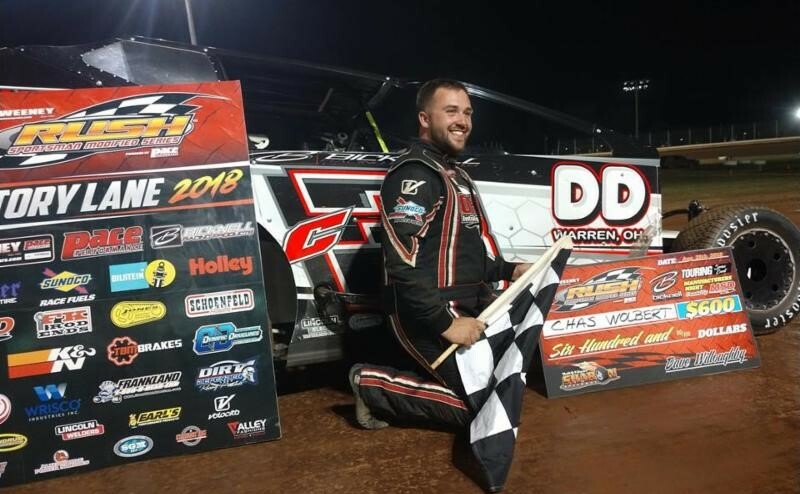 An all-time record high of 38 cars turned out for the fifth annual "Manufacturers Night" presented by MSD Performance as a record amount of more than $20,000 in product was distributed to the competing racers by random draw during intermission. Prizes ranged from a minimum of $300 up to $1,420 in value. "This is crazy," stated the 24-year-old Warren, Ohio winner. "Four in a row for us and to win a tour race- I can't believe it. Track was great, my car was great. I had a good starting spot and was patient. I knew I had 25 laps and worked my way up through there and hit every point I needed to hit. We have great competition here. Anyone can win week in and week out. I didn't see Steve (Slater), but he's not afraid to run out there (top). Steve is a good driver and if he had a little bit more he would have had me. I'm glad to be back in here in victory lane. Without God none of this or life is possible. I have to thank all of my sponsors and everyone that helps out on the car." Other race notes, Tony Tatgenhorst won the "shock the clock" top qualifier award, earning an extra $100, and Garrett Krummert, who leads the Bicknell weekly series points, finished fourth. That finish was good enough to earn him his first track title at Sharon.